Although best known as a master of trompe l’oeil, illusionistic painting, Richard Haas, a Wisconsin-born painter who now resides in New York City, also began creating diorama boxes in the 1960s as a means of exploring in intimate, three-dimensional scale the inner worlds of the great masters of art history. 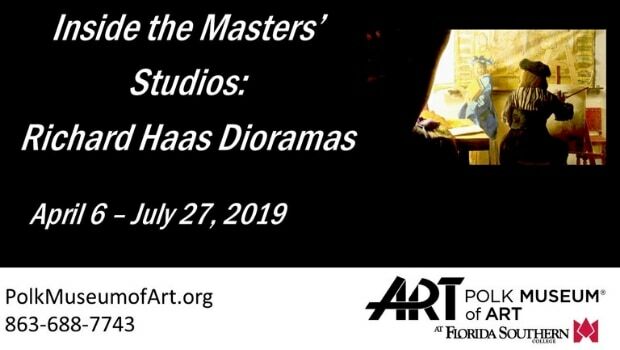 An unusually personal show, Inside the Masters’ Studios: Richard Haas Dioramas presents each Museum visitor with his or her own individualized viewing experience. Haas’ meticulously rendered and deeply-researched dioramas re-imagine the famed creative environments of the most world-famous artists from Vermeer to Corot and Picasso to Pollock and take us back in time to peer into the very rooms in which some of the greatest works of art of all time were made.